Took a while to figure this one out. I initially just wanted to make a flat owl shape, but thought it would be nice to give it some texture. I tried incorporating the v‐stitch but it didn’t look quite right… so I thought I’d try the loop stitch again and I think it looks rather fluffy and cute! It looks like the loop stitch is becoming one of my favourites (I’ll have to show you a larger scale project that I just finished, involving hundreds of loop stitches). Hope you like it as much as I do! By the way, I found a slightly different way of making the loop stitch on We are Knitters, which seems a bit more secure. The video tutorial can be viewed here (nice music too!). Notes: it’s worked from top to bottom to accommodate the direction of the loops, then reattach yarn to crochet the head. For the 2 different shades in the body, MC is main colour and CC is contrasting colour. Carry the colour that is not in use up the rows when switching colours. Row 2: ch 1 (turning ch 1 does not count as a st), lp st (loop stitch) in each sc across, turn. Row 3: change to CC, ch 1, 2 sc in first st, sc in each st across until second last st, 2 sc in last sc, turn. Row 4: ch 1, lp st in each sc across, turn. Row 5: change to MC, ch 1, 1 sc in each st across, turn. Row 6: ch 1, lp st in each sc across, turn. Row 7: change to CC, ch 1, 2 sc tog over first 2 st, 1 sc in each st across until last 2 st, 2 sc tog over next 2 st, turn. Row 8: ch 1, lp st in each sc across, turn. Row 9: change to MC, ch 1, 2 sc tog over first 2 sc, 1 sc in each st across until last 2 st, 2 sc tog over next 2 sc, turn. Row 10: ch 1, 1 sc in each sc across, fasten off. Now we make the head. With MC and wrong side facing you, attach yarn to the first row of body. Row 1: ch 1, 1 sc in each st across, turn. Row 2: ch 2, sl st in 2nd ch from hook, 1 sc in each of the next 3 sc across, 3 sc in next sc, 1 sc in each of the next 3 sc across, ch 2, sl st in 2nd ch from hook, sl st in the bottom of last sc just made (i.e. in the first sc of previous row), fasten off. Note: back is worked from bottom to top in one piece and with MC only. Row 1: ch 1, 1 sc in each ch across, turn. Row 2: ch 1, 2 sc in first sc, 1 sc in each sc across until second last sc, 2 sc in last sc, turn. Row 3: ch 1, 1 sc in each sc across, turn. Row 5–7: Repeat row 3 (i.e. work even). Row 8: ch 1, 2 sc tog over first 2 sc, 1 sc in each sc across until last 2 sc, 2 sc tog over last 2 sc, turn. Row 9: ch 1, 1 sc in each sc across, turn. Row 11–12: Repeat rows 1–2 of head. Fasten off, leave long tail for sewing. Row 1: 2 dc in 4th ch from hook, turn. Row 2: ch 3 (turning ch 3 counts as a stitch), 2 dc in next dc, dc in top of beginning ch 3, turn. Row 3: ch 3, 3 dc tog over next 2 dc and top of turning ch 3. Fasten off, leave 3–4″ of tail for sewing. Cut 2 circles for eyes. 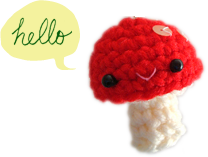 I cut mine about 1/2″ wide, but you can make them smaller or larger if you like. Owl plushes with giant eyes are very cool‐looking too. 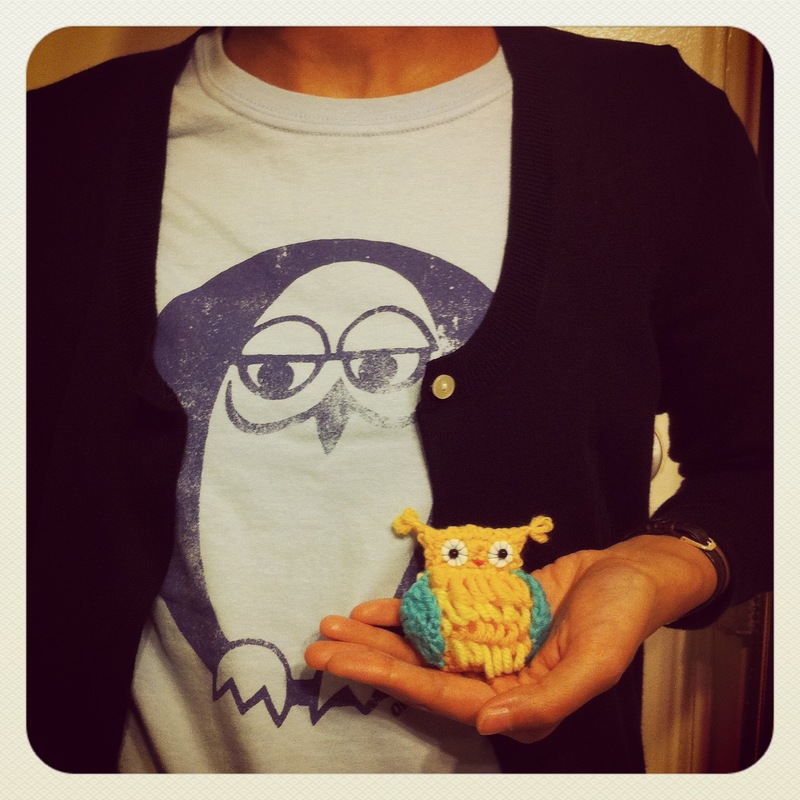 Sew eyes on the head of owl with blue embroider thread, if you like that look. Sew on black beads to complete eyes. Sew front and back together. I made two small loops at each ear while sewing but that’s optional. If you’re making an ornament you may also want to make a loop with a ribbon and sandwich it between the front and back and sew it all together. Would be fun to make it with different colour combinations. And if I were to make another, I would probably try to make the loops a bit smaller. It would be so exciting to see the different owls everyone makes! OK, I am just about breathless with excitement!!! I have been so far away from the few blogs I follow, so wow I’ve been missing all this delightful woodland goodness! Now, normally I would say the owl is my favorite, but I really do have this thing for hedgehogs :-). I will check out your Ravelry group. Thanks so much for sharing all your wonderful creativity! Awww, so cute!! 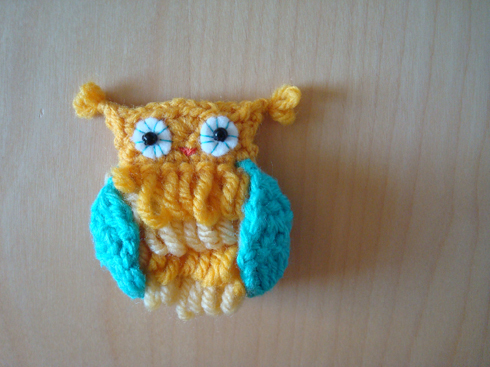 The loop stitch is perfect for this owl! I recently played around with that stitch for a squirrel tail and loved it! thanks kate! and loop stitch would make such fluffy tail! that’s an awesome idea! Ohh I just found your wonderful blog through pinterest. Have been looking for christmas decoartions to crochet. Thank you soo much for posting these adorable woodland creature patterns. My tree is about to look a whole lot better.Merry Christmas and thanks again! !